Un bon petit programme pas cher! DestinÃ© Ã normaliser les volumes sonores de nos MP3, ce programme sâacquitte de sa tache avec efficacitÃ© et discrÃ©tion. En plus, MP3 normalizer rÃ©cupÃ¨re les tags sur le WEb. TrÃ¨s bon achat pour cette app simple dâutilisation. MP3 Normalizer improves a sound of MP3 files, supports Peak and Loudness (EBU R128) Normalization methods and Automatic Volume Control for processing of speech records. Simultaneously with normalization, MP3 Normalizer can apply Audio Effects, such as trimming of silence, fade-in, and fade-out for better playback. There are just some common cases of using MP3 Normalizer. However, you can apply it for much wider range of purposes. MP3 Normalizer accepts .mp3 and .wav files. 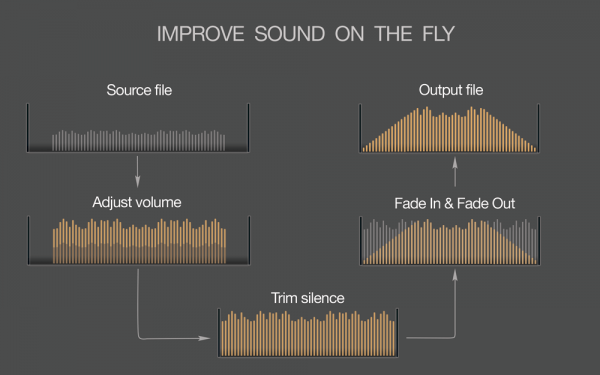 As an output, you will have a new MP3 file with adjusted volume level and applied audio effects. Please, note, that if you would like to normalize audio files of other formats, you have to convert them to MP3 first. We recommend using our To MP3 Converter for this purpose. To normalize your MP3 files you have just to drop them in application icon or window. The application will let you know when volume adjusting is done. MP3 Normalizer supports batch processing so you can process a single file or an entire tree of folders at one time. MP3 Normalizer allows to adjust a volume of the unlimited number of files and folders in one click and supports multiple normalizations simultaneously. If you process an entire tree of folders, MP3 Normalizer will replicate the structure of source folders. It is especially convenient if you need to adjust the volume of entire music collection. "...batch normalize MP3 and WAV files in no time." By default, MP3 Normalizer analyses every audio track and applies Peak Normalization algorithm with Target Level 0 dBFS. 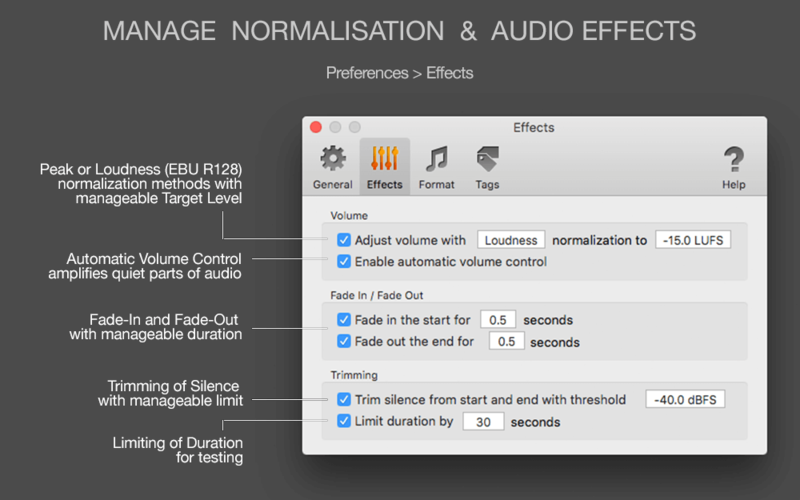 You can normalize either by Peak or Loudness (EBU R128) methods by choosing required method in Preferences. For improving the quality of voice records - we recommend enabling Automatic Volume Control, a feature which applies special processing of voice records. 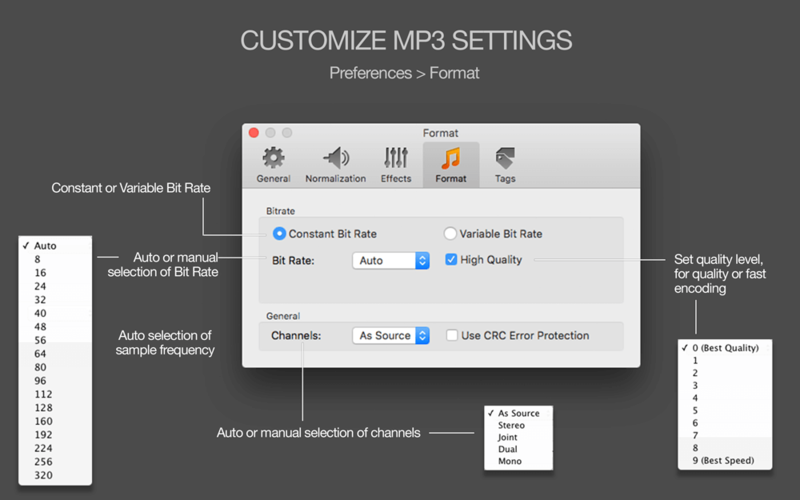 MP3 Normalizer estimates Bit Rate, Sample Rate and Channels, and applies optimal settings to output MP3s. 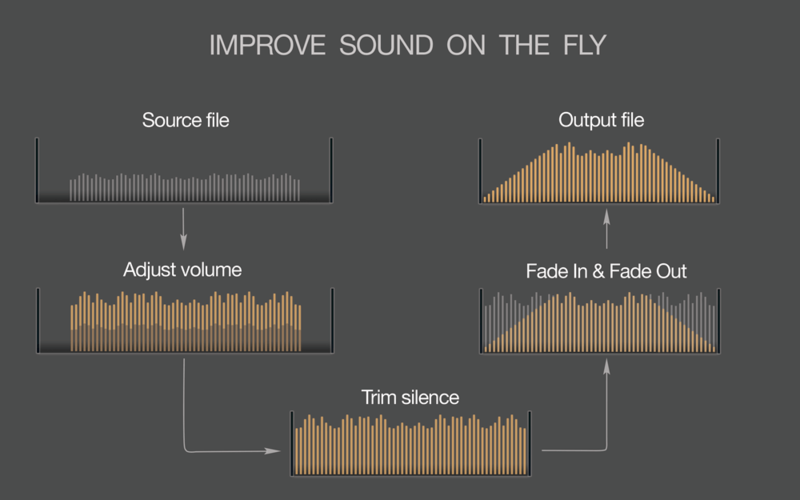 It guarantees the best possible sound quality, saves your time and hard drive space. If you would like to convert to a special Bit Rate, Channels, etc., just change settings in the Preferences. MP3 Normalizer can apply fade-in and fade-out; trim silence in the start and end of audio tracks automatically. To use the effects simultaneously with volume adjusting, just enable them in Preferences. 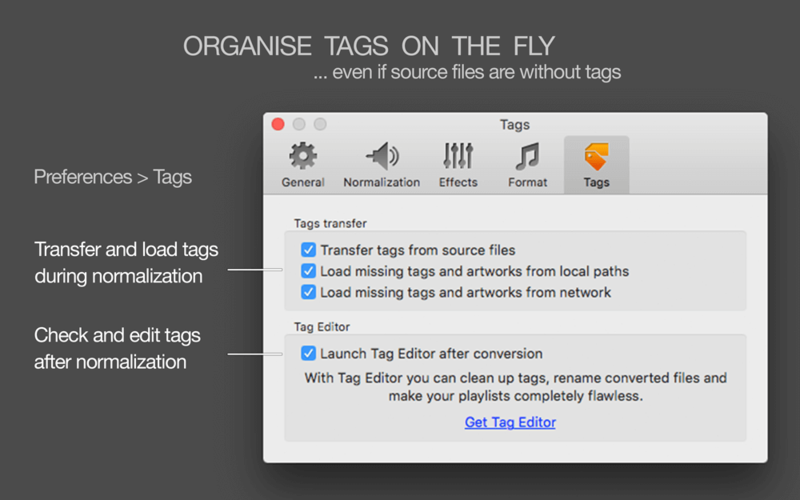 MP3 Normalizer transfers all tags from source .mp3 or .wav file to normalized file. If you would like to check or modify tags after normalization, please, use our Tag Editor. 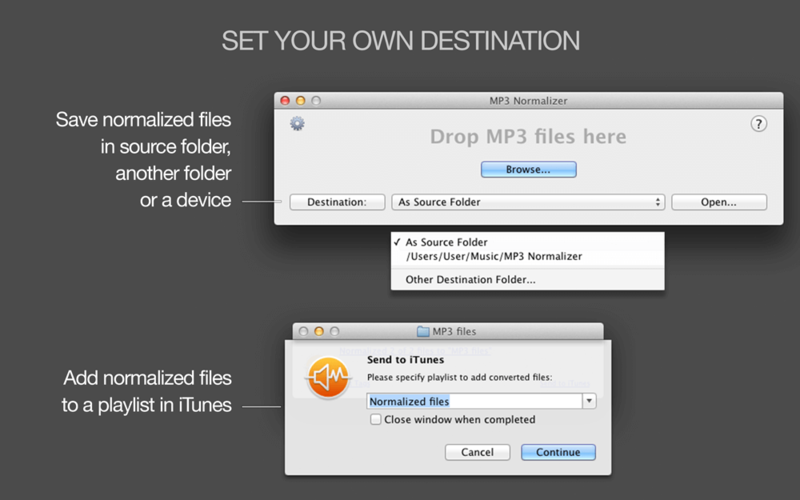 MP3 Normalizer allows exporting converted tracks to new or existing iTunes playlists by a quick and easy way. *Note, we advice select Bitrate at 128 or lower meaning if you will burn normalized MP3 files to CD and listen to it in your car. Many CD car players couldn’t read MP3 files with Bitrates higher than 128 kbps.